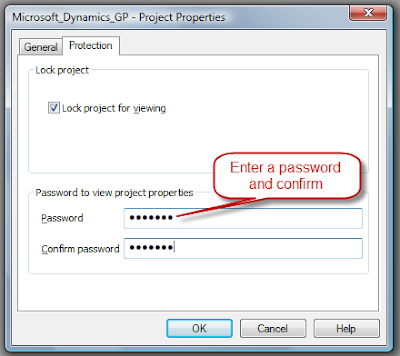 It seems that nowadays we can add security to pretty much every aspect of the Microsoft Dynamics GP application, but when it comes to VBA projects things are not too clear for many developers and Dynamics GP systems administrators. Follow these simple steps to secure your VBA project. 1. Open the Visual Basic Editor. 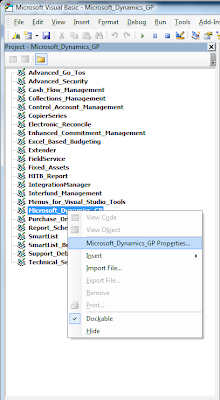 Go to Microsoft Dynamics GP > Tools > Customize > Visual Basic Editor, or press ALT+F11 from your keyboard. 2. Open the project's Properties window. Right-click on the project within Project Explorer and select the project Properties option. You can also access the project Properties window by highlighting the project and using the Tools menu. 3. 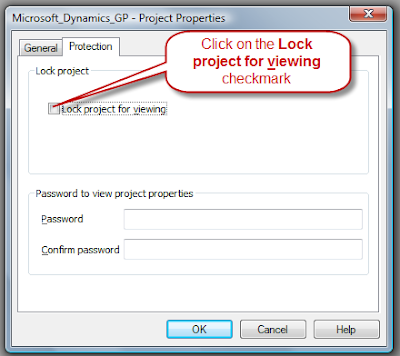 Click on the Protection tab, then click on the Lock project for viewing checkmark. 4. Enter a password to prevent unauthorized access, then confirm the password entered. 5. Press Ok to apply the settings. 6. Save your VBA project and exit Dynamics GP. When you access the application next time and attempt to access your VBA project you will be prompted to enter a password to display it's content. I have protected the vba code as you said. If i have exported the vba package and open the package with a notepad, then i can able to view all the vba code. Is there any other solution available to protect or encrypt the vba code? Not that I am aware of. You can of course, store your code in a secure code repository such as Visual SourceSafe. You can also limit security to the Customization Maintenance window, but eventually, when the package file is exported, it will need to be manipulated by authorized users and/or system administrators to minimize the risk of this occurring.